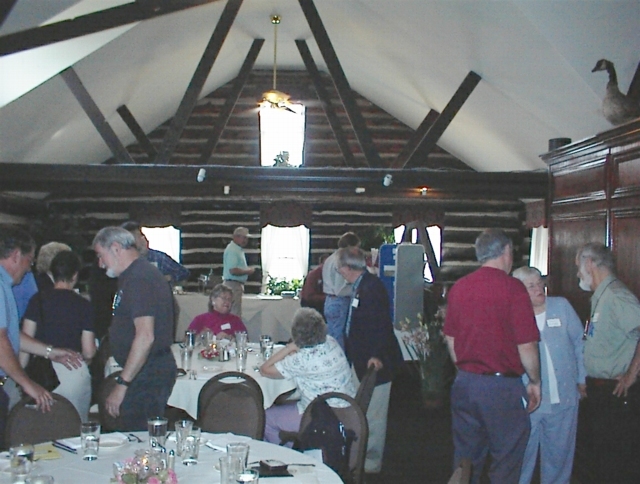 The CPMBS Annual Meeting was held on April 20, 2002, at the spacious and atmospheric Blue Pointe Grille restaurant in Ellicott City, Maryland. The board held its business meeting at 9:00 a.m, which included many interesting discussions, including the Union Cemetery situation in Montgomery County where road widening threatens it. 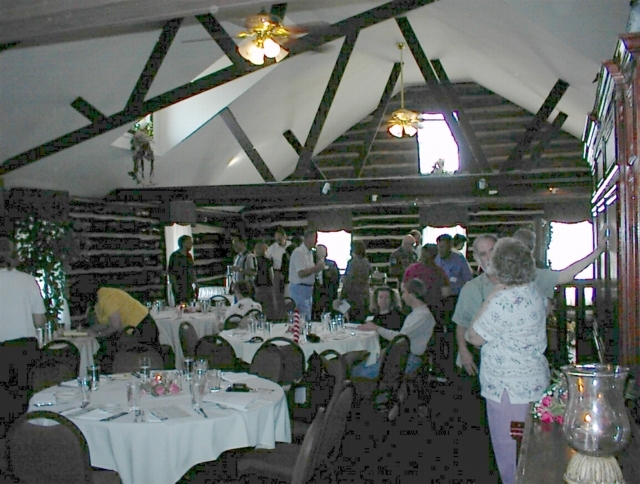 Immediately following the adjournment of the business meeting, Barbara Sikora called the slate of officers: Kristin Kraske of Howard County was re-elected as President; Ed Taylor of Allegany County as Vice President; and Leonard Becraft, Ann Bolt, Dottie Brault, Melvin Mason, and Jim Trader continued in their posts as Directors. At the conclusion of the elections, Jean Keenan introduced the 2002 winners of the Periwinkle Awards. 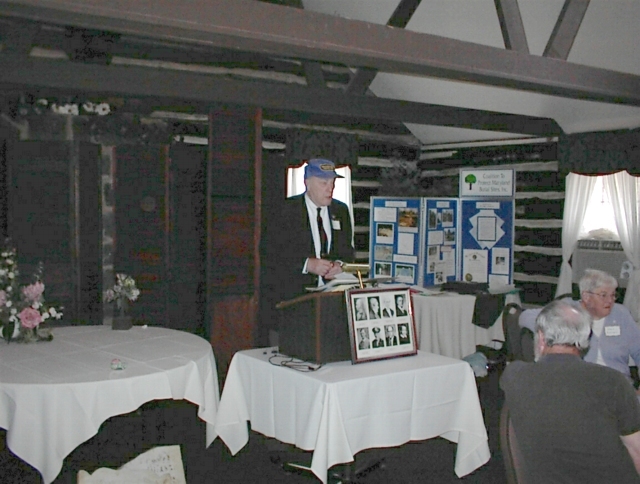 (Perwinkle Award Recipients 2002 ) The first speaker of the day was Robert Mosko of Jorden’s Dad Restoration and Repair. His discussion focused on tombstone repair and preservation and provided much good advice, especially for avoiding common methods of reading stones that are injurious to them. John Stewart Morton, Jr., followed Mr. Mosko with a fascinating discussion of Westminster Burying Ground in Baltimore and his family’s vault there, where up to 11 generations were buried. The final speaker was Steven Sklar who discussed the functions and operation of his Office of Cemetery Oversight. 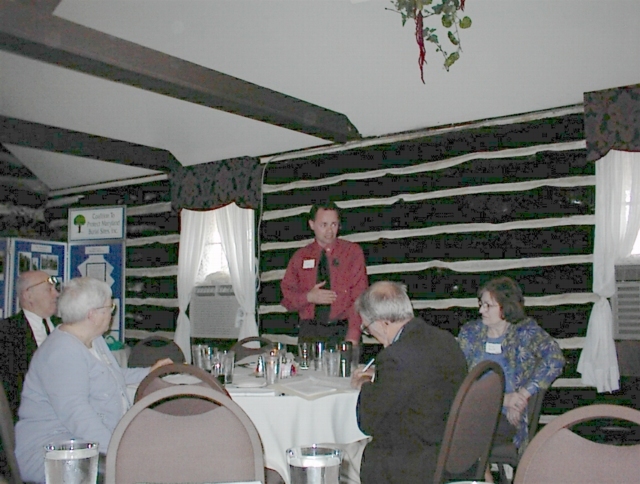 His discussion provided much insight into how the OCO works and what we can expect from them as preservationists. Following a wonderful lunch provided by the restaurant and Mr. Sklar’s discussion, participants boarded a bus and visited Old St. Paul’s Cemetery in Baltimore, Maryland. 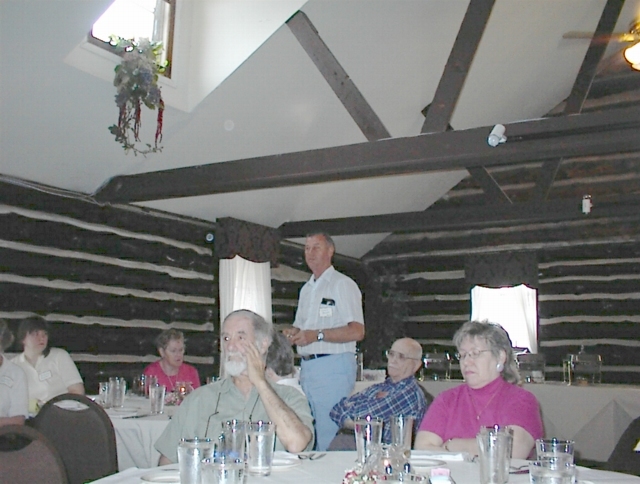 Rick Tomlinson, a former member of the St. Paul’s congregation and the cemetery overseer provided an excellent introduction of the history of Old St. Paul’s to the attendees. After the informative talk, CPMBS members and visitors roamed the graveyard. After Old St. Paul’s, the bus driver very nicely gave into pleas from the riders to take them by Westminster Burying Ground, which is only a few blocks away. We spent around 15 minutes in the grounds, taking in as much as we could. The bus then returned to the restaurant and everyone debarked, lamenting the end to a terrific day! Jorden’s Dad Cemetery Monument Restoration and Repair was established in 1996 after Robert found it necessary to be more available to his family and his fascination with history became to overwhelming. For the first 2 years he researched, read, and experimented with marble and granite repair. He worked with Mathias Monuments of Westminster, Maryland who were instrumental in providing technical support. He has studied and practiced restoration and repair techniques from both Canada and the United States. 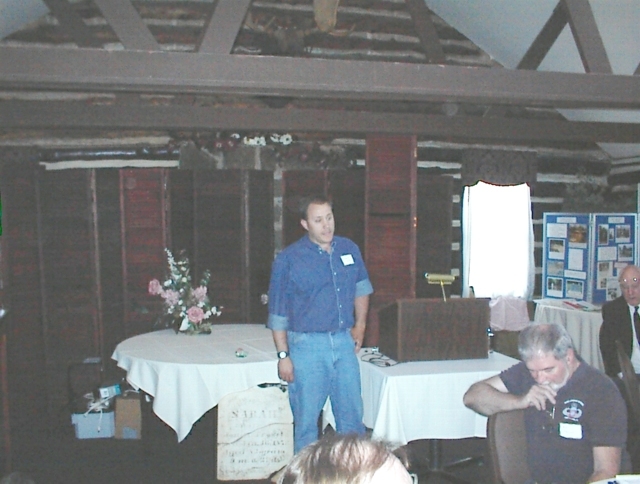 His skills include plotting, surveying, and the use of a standard numbering and inventory form for record keeping and future research, cemetery documentation, proper lifting and handling techniques of historical cemetery grave markers and monuments, cleaning and repairing as well as resetting. He is currently studying materials and monument types along with decay mechanisms. His first project in 1998 involved 58 graves stones and markers. Since then he has adapted and perfected the most innovative, technical, as well as creative, techniques in the field from custom designing and building his own equipment, to pinning, mending, filling, and patching some of the most deteriorated markers that can be found. To date he has handled and worked on more than 735 cemetery grave stones and markers in both Maryland and Pennsylvania, with an additional 4 projects pending. He has come to specialize in monument restoration, preservation and conservation, cleaning and vandalism repair. Mr. Morton was born in Baltimore, MD in 1918 and continues to reside there, 83 years later. He became interested in Westminster Burying Ground about 1970. The Morton family is located in Westminster and contains the remains of ten or eleven family members dating back to his 3rd great-grandfather. 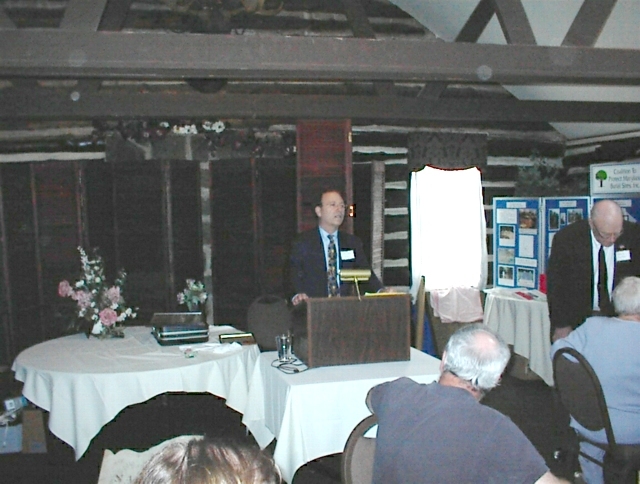 Steve Sklar was appointed Director of the Maryland Office of Cemetery Oversight in the Department of labor, Licensing, and Regulation in June, 1998. Prior to accepting this position, Mr. Sklar served both as an elected official and business consultant. He represented Baltimore City in the House of Delegates of the Maryland Legislature for 14 years specializing in consumer protection, public health, consumer finance, and government affairs consultant to national industry associations. His career in both the public and private sectors includes directing national advertising and public relations programs, lecturing at universities and government agencies, and serving as co-chair of the Maryland Consumers Council. Since his appointment as the regulator of the cemetery, monument dealer and burial goods sectors of Maryland’s death care industry, Mr. Sklar has been elected vice-president of the North American Cemetery Regulators Association and serves as chair of its Consumer Affairs Committee. He is the first recipient of the Association’s President’s Award for advancing the consumer agenda. Mr. Sklar has also testified before federal agencies and contributed to numerous published articles dealing with death care issues. An attorney and native of Baltimore, Steve Sklar holds a Bachelor of science degree in Economics from the Wharton School of Business, University of Pennsylvania, and a Juris Doctor degree from the University of Maryland School of Law. He is married and the father of one son.